Today is the first day of summer and I spent the day making jam. There is something about standing, barefoot in my kitchen, on a warm sunny day, with the breezes blowing from the open window, as I prepare the fruit for my jam. It seems to fill all my senses! 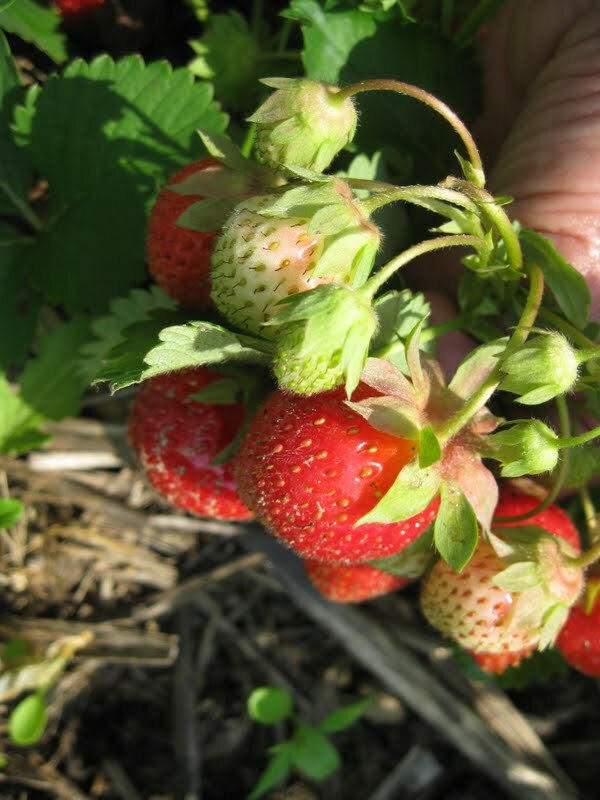 It is a right of passage that happens each summer as the new crop of berries come to maturity. It is something that I do that totally emulates my mother. Something that brings back wonderful memories of summers past. Picking berries and peaches, barbecues and trips to the lake. During the summer the air in our house was always filled with the thick sweet aroma of cooked peaches, as my mother made jam and canned peaches from my grandfathers orchard. I don't do canning…I have always been a bit afraid of killing someone off with botulism. I do make Jam!! It brings me joy to make it and to give it away! So today, I made Strawberry and Strawberry-Rhubarb Vanilla Jam. I use Sure-Jel to make most of my jams. My strawberry recipe is from the Sure-Jel brochure. We are in the midst of Strawberry season here in NJ. A few days ago I went out Strawberry picking. I go every spring to this wonderful "pick your own" farm located not far from my home. I picked two beautiful baskets and will be making a Strawberry-Rhubarb pie tomorrow. Before you start have your jars washed and sterilized. Add the lids to a pot with water and bring to a boil and simmer until ready to use. fruit with sugar and place in an 8 quart pot. Bring mixture to a full rolling boil, one that cannot be stirred down, stirring constantly. Add certo all at once to pot and then boil 1 minute stirring constantly. Remove from heat and skim any foam if necessary. Then scrape the vanilla bean into the pot and stir. Ladle into hot sterilized jars…leaving 1/4 inch headspace. Wipe rims with a wet clean cloth and place the lids onto the jar and then add the bands. Tighten the bands on the jars, and turn upside down for 5 minutes. Then turn right side up and let rest. You should hear them start to seal…you will hear them popping. After 24 hours check for seal and store in a cool dry place. I keep mine in a second refrigerator. I do not use a water bath…I have been making jam for years and these are the instructions that I have always followed. Delicious and ready for giving away! I so enjoyed this post Kathy! You are so very lucky to be able to spend the first day of summer making jam in your kitchen. :) What great memories and your jam looks fabulous. I love your copper tray! What a perfect way to spend the first day of summer, Kathy! Your jam sounds delicious! I'm hoping to go strawberry picking Saturday and make jam, but I use the Sure-Jell freezer method. I made your tabbouli recipe twice in the last week. I wrote about it in my newest post. Thanks for the recipe! It's a new favorite. What a labor of love! Beautiful post, Kathy! I wish our strawberry fields were looking as nice as yours! I've never tried your method of making jam, it sounds much easier than mine!! I might be a convert! You are lucky! Strawberry season is well over down here in the South. I did get there in time for lovely blackberries. The jam looks wonderful and thank you for showing how to do this. I have never made jam! I love the pictures of the kids in the strawberry field. I just made a cookbook on blurb for my daughter's shower whose cover featured us picking strawberries when she was young. I'll have to post the picture after the shower since it's a surprise. Thanks for sharing this recipe. Kathy, you wrote a great detailed post for someone like me who has never attempted making my own jam! I really need to try one day and will definitely refer back to this. The color is gorgeous!